While mashed potatoes are not complicated to make, the process may be time-consuming. Instant mashed potato flakes, made from dehydrated, cooked potatoes, speed up the process. You can reconstitute them with water or milk, or use them as an ingredient in breads, gnocchi or gravies. Before buying instant mashed potatoes, be aware of their ingredients – which vary slightly by brand – because they include much more than just potatoes. Russet or Yukon gold potatoes are the main ingredient in instant mashed potatoes. They are cooked and dehydrated, and some brands add sodium bisulfate, BHA and citric acid to preserve the potatoes’ color and flavor. The Center for Science in the Public Interest recommends avoiding BHA, short for butylated hydroxyanisole, as some studies suggest it may be a carcinogen and safer alternatives exist. 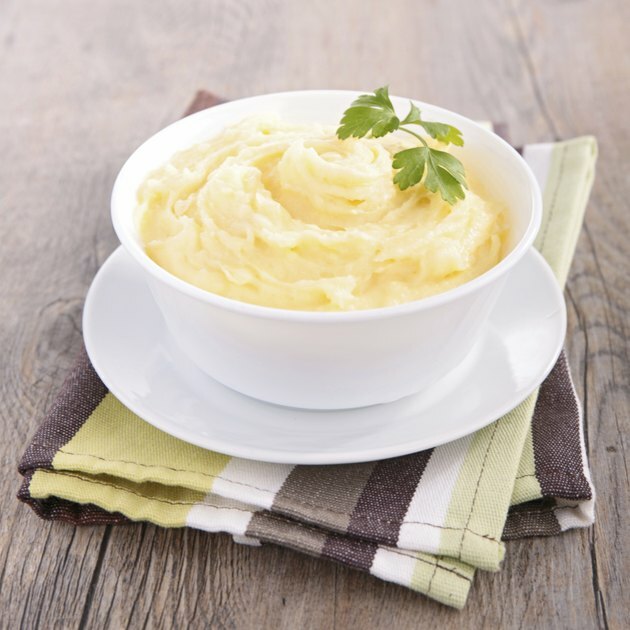 Instant mashed potatoes contain a mix of oils, including soybean, cottonseed, sunflower and coconut oil. In several brands, these oils are partially hydrogenated to increase shelf life. Partially hydrogenated oils contain trans fats, the type that the American Heart Association suggest you avoid altogether because they both elevate your bad levels of cholesterol and lower your good levels. Instant mashed potatoes contain one or more sweeteners, depending on the brand. Corn syrup solids, maltodextrin and table sugar are specific types often included. Some manufacturers do not add sweeteners, so check specific brands’ packaging to be sure of what you are getting. Instant mashed potatoes usually include nonfat dry milk and whey powder – derived from the cheese-making process. Some brands also contain butter or butter powder. Nonfat milk solids are another ingredient found in some brands. Instant mashed potatoes have a shelf-life advantage over fresh. Manufacturers add preservatives to maintain the instant mashed potatoes’ freshness. In addition to BHA, citric acid and sodium bisulfate, the potatoes may include sodium acid pyrophosphate and dipotassium phosphate. Silicon dioxide is also added to prevent the potato flakes from forming clumps during storage. Instant mashed potatoes may include spices, salt and natural and artificial flavors.